Interesting Facts: Charmander is easily the most mild-mannered of its evolution line. Its health and emotions can be easily read by paying attention to the flame on the tip of its tail. For example, if the flame grows suddenly, the Charmander is probably angered, and perhaps even using a Rage attack. It is rarely found in the wild. The flame that burns at the tip of its tail is an indication of its emotions. The flame wavers when Charmander is enjoying itself. If the Pokémon becomes enraged, the flame burns fiercely. It evolves into Charmeleon at level 16, and then evolves into Charizard at level 36. NOTES: This one is relatively straight-forward - keeping in mind that hands and feet can always be tricky. Please follow the written instructions, on the PDF, regarding the flame assembly. And a penny glued to the inside of the tummy is recommended for stability. Winrar says that this file has an "unexpected end of archive." Is the file damaged or did I do something wrong? I'd suggest downloading again, I just tested the files and everything seems working correctly. I tried downloading it in Firefox and it worked! Thanks for the craft! I just finished this model this morning! He turned out really well, thanks so much! I'm a little new at this, and I watched the How-To on the website. For folding, it said that dotted lines go inside the fold and solid lines go out... Following that, wouldn't the dotted lines make the charmander inside out? I know this is a noob question, I'm just really confused. Thanks! the cut lines are around the pieces and it's what you cut. i tried to open the pdo file, but i dont know how to. do u think u could tell me how to open it? please, and thank you! You may need to download Pepakura viewer 3 to view the pdo - all our pdos are only compatible with V3. 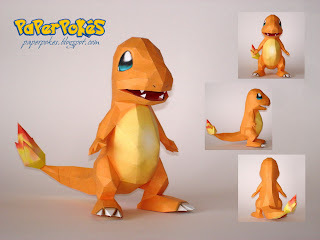 charmander papercraft is cool but i love charizard can you make him plz!!!!!!!!!!!!!!!!!!!!!!!!!!!!!!!!!!!!!!!!!!!!!!!!!!!!!!!!!!!!!!!!!!!!!!!!!!!!!!!!!!!!!!!!!!!!!!!!!!!!!!!!!!!!!!! I am having trouble with the arms. Can anyone help me out? why doesnt someone post a video? ...Because no video was made? Not exactly sure why you'd want one anyway. The pdfs are inside of the zip files, which have to be extracted with either Winzip (which is on your computer already) or Winrar, which is free to download/use. Can find more information about programs, along with links, in the FAQ. wait, do you use paper of your own or do you like printout this big sheet that had the image of pikachu/the pokemon on it????????? We use normal paper, and just print the templates provided in the download packs to print out the parts. i cant find the instructions...please help??? just aove the comments, u should see something that says "Download: A4 / Letter". if ur usg A4 sized paper, click A4. if ur usig letter sized paper, click Letter. Can you explain how to attach the chin, i dont really get it, thanks! ive downloaded this file and have tired opening it in pepakura and it says that it cannot open file.. please help!!! !